Sometimes when we’ve got a good thing going we tend to want to make it better and bigger. In simply piling more content on, the game can lose track of what once made it great. Assassin’s Creed has seen a departure from some of the core aspects of the series with a bigger focus on hunting, running through forests, and commanding a crew of surly pirates. Last year, although I loved the game overall, I had to admit that the assassin aspects of the Assassin’s Creed: Black Flag had become dull and boring compared to the grandiose additions of piracy on the high seas. Ubisoft decided to take a different approach with Assassin’s Creed Unity, and so marks a true return to form for the series. Welcome to 18th century France, where turmoil is around every corner and the people can’t trust their government. Where there is political unrest, of course the Templars can’t be far behind, and this war torn Paris provides the perfect backdrop for Arno’s Romeo and Juliet of a tale. The narrative spans from an early tragedy in his life and throws him into a crusade for vengeance to protect those he loves, despite differing allegiances. Arno is perhaps my favorite of all of the Assassins that we’ve had the pleasure of meeting through the years. He’s got charm, drive, devotion, and perhaps best of all, his motivations feel real. His story blends perfectly with his environment which makes everything flow nicely from point to point as he seeks his answers. Paris is a city in conflict, and it shows. People litter the streets in numbers never seen before in an Assassin’s Creed game. Droves of rioters in front of government buildings. Crowds that turn out for public executions. These aren’t just seen in cinematics, but actually help to bring the French Revolution to life in gameplay. The impressive crowd size has one downfall, and that is in Arno’s interaction with the crowds. He doesn’t gently touch their shoulders or arms to wade through the masses. Instead, citizens artlessly skate out of the way as if they are on ice. I tried again and again to illicit some sort of reaction, but was met with disappointment each time. It was as if Arno and the crowds existed separately from one another. I know it is possible to have them interact naturally, as past Assassin’s Creed games have done it, so it seems like a glaring omission. The addition of more AI to the crowds is not the only thing that Unity has to croon about though. 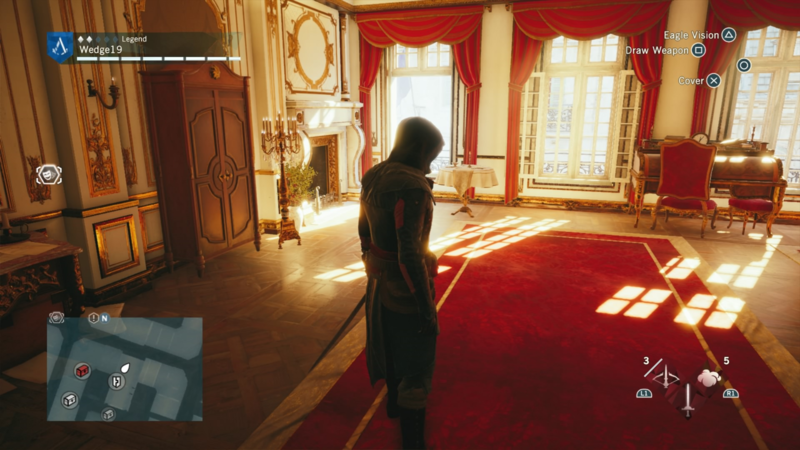 Assassin’s Creed Unity actually removes features that have been added on to the series, instead opting to focus on the core elements of what made the Assassin’s Creed games great in their inception, and subsequently build upon those. Ubisoft have found resounding success in going back to basics to reinforce these pillars of the series as opposed to just tacking more features on. There are no more forests and plains to run through and no high seas to sail. You won’t be hunting animals, and you won’t even be playing competitive multiplayer this time around. Climbing, one of the core elements of the series, has been given a bit of a makeover. Instead of only holding R2 to freerun, you can now add the cross or circle buttons to free-run upwards or downwards respectively. This means that the odd object magnetism from previous games that made you jump across to another ledge instead of down to the streets below is significantly reduced. If you want to get back down the the street, hold R2 and circle, and your free-run will direct you downward. It’s still not perfect, and will take some getting used to for veterans of the series, but this is the most control that I’ve ever felt I had over where my assassin is going, not to mention that climbing down things is now immensely faster than before. Another of the main pillars getting a change this time around is the combat. Instead of blocking while waiting around for the next enemy to attack and countering him for a kill, there is now a level of unpredictability and the dedicated block button is gone. There is now a certain challenge and strategy to combat that ensures players will be attempting to take a stealthier route, lest they wind up facing the death a lot. Enemies are also rated by difficulty, and mixed battles can occur. So while one may be extremely easy to kill, the guy next to him may be able to take Arno out within a couple of hits. 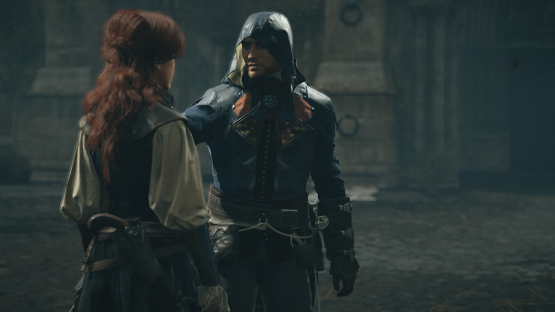 Missions are also structured with these difficulties in mind, meaning that progression through the game will require that Arno be upgraded and prepared for the mission ahead. The progression always felt natural to me and never devolved into a fruitless grind to obtain a more powerful piece of gear. To combat this difficulty progression, Arno can be fully upgraded by buying or earning new gear, from weapons, to his hood, and even down to his pants. That’s right. Unity has customizable Assassin pants. Each of these pieces of gear give Arno a different look and different increasing stats, depending on if you prefer to focus on health for brute force, or stealth for the silent approach. If you are going for stealth, there is also a dedicated stealth button in addition to a cover system to allow Arno to bypass fights and take out enemies with a reticent hidden blade in the shadows. This seemingly basic addition drastically changes the way that Unity can be played, and allows for Arno to feel more like a true Assassin. 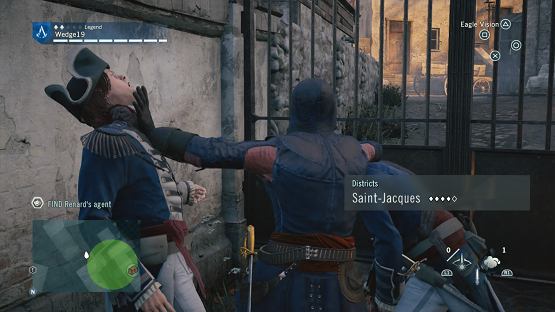 Assassinations in Unity are made fun by not offering a direct or basic path to the enemy. Arno will scour his surroundings for opportunities that can lead to unique kills. Sure, I could charge in without a care in the world and attempt to fight near endless hordes of enemies as I seek to eliminate my target, but Arno has noticed a few things. An impending meeting. A stolen key. These observations lend me additional objectives that open up alternate pathways free from enemies and the ability to murder my target within the cover of a confessional booth rather than out in the open with his entourage, if I so choose. Exploration and freedom are encouraged during these encounters and it’s likely that people will approach each situation with very different solutions in mind. One major addition in light of the removal of competitive multiplayer are the co-op missions. In a game as great as Unity is seeming so far, online play might seem like a sore thumb, but you can put away the painkillers, because the cooperative mode blends amazingly with the rest of the game and doesn’t feel out of bounds. The missions play like any other single player mission might within the open world of Paris, but this time you’ve got friends along for the ride. I didn’t get a chance to fully explore the possibilities of the cooperative features, but the limited play I got with other reviewers makes me eager to jump back into the co-op with friends once they get the game. What would an Assassin’s Creed game be without a great open world to house a huge plethora of content? Unity doesn’t disappoint here and has a huge variety of collectibles, side missions, and marks the return of the economy system to earn Arno money, albeit with a much simpler focus than the convoluted shipping and trade system we had on our pirate outing. There are also murder mysteries to take part in that use Arno’s Assassin senses to curate clues, solve a puzzle, and accuse the guilty party, similarly to the recent Sherlock Holmes game that released. Everything in the world lends itself to the back-to-basics ideal that seems to have hit Unity, and it works every step of the way. Unity doesn’t just play well, it looks beautiful too. The graphics have a stunning painted quality to them that may be attributed to the way that different materials react to the lighting. Velvet is lit like real velvet, leather like leather, and wood like wood. Stained glass windows and rooms gilded with gold reflect appropriately. Time of day and weather changes affect these as well. Each material reacts to the lighting uniquely, so the world seems much more vibrant. And then there is Elise’s hair. I can’t get over looking at her hair, which has an almost Pixar-like quality to it. Whoever at Ubisoft worked on her hair, excellent job, and keep it up. With Unity, I felt like I was playing Assassin’s Creed 1 and 2 again, with improvements that made sense to the series as opposed to the odd additions that strayed too far from the creed. The entire experience was enrapturing, and the odd skating citizens in crowds were not enough to deter me from thoroughly loving every moment that I spent with Arno. I don’t give Assassin’s Creed Unity a perfect score lightly, but a return to the core of the series and a strengthening of those central pillars makes Unity shine like the glint of a well polished hidden blade and stay true to the creed. 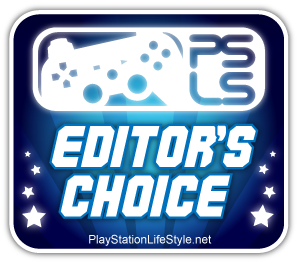 Assassin’s Creed Unity review copy provided by publisher. For information on scoring, please read our Review Policy here.